Appearing as verdant woodlands among the low limestone hills of north-central Texas's Callahan Divide, Abilene State Park and its attendant groves of oak, elm, and pecan trees, sit along Elm Creek and Lake Abilene. The 529-acre park was developed in several stages—fall of 1933 through September 1934 and then June-September 1935--by two distinct CCC companies--one a mixed-race unit of World War I veterans, the other an all-black veterans' group. Working with native and local materials, such as limestone and red Permian sandstone, these mature men crafted the concession building’s high masonry arches and the pool shelters’ pyramidal roofs, designs reminiscent of classic Romanesque architecture. 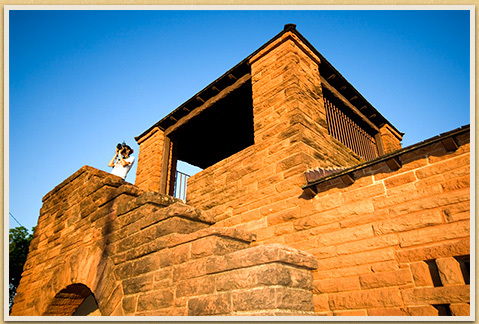 The many cut red-sandstone features—visible on structures as diverse as picnic tables and pergolas—were the vision of Texas architects David Castle of Abilene, and Olin Boese and F. W. Digby-Roberts of the State Parks Board’s Central Design Office in Austin whose efforts were funded by the National Park Service. The CCC work on the 529-acre park concluded in 1935. Concession Building, Swimming Pool, Two Pool Shelters, Pergolas, Water Tower, Stone Pump House, Water Fountains, Stone Seats and Picnic Tables, Round Table, and Fireplaces. Entrance Portals and Culverts were lost when the Park Road 32 was widened.